You most probably installed DonutLeads onto your computer together with some other adware or freeware applications. It is very likely that you did not notice that you were about to install DonutLeads. It is not too surprising because users often skip important installation steps just to be done with it as soon as possible. However, if you have DonutLeads running on your system – do not panic. It is just an adware application, and it cannot infect you with malware programs. Nevertheless, it is strongly recommended to remove DonutLeads from the system as the program could be exploited by third parties. This application may also be named DonutQuotes, and it comes from the same group as PastaQuotes, PastaLeads and PureLeads. The official homepage for this application can be accessed at donutleads.com. 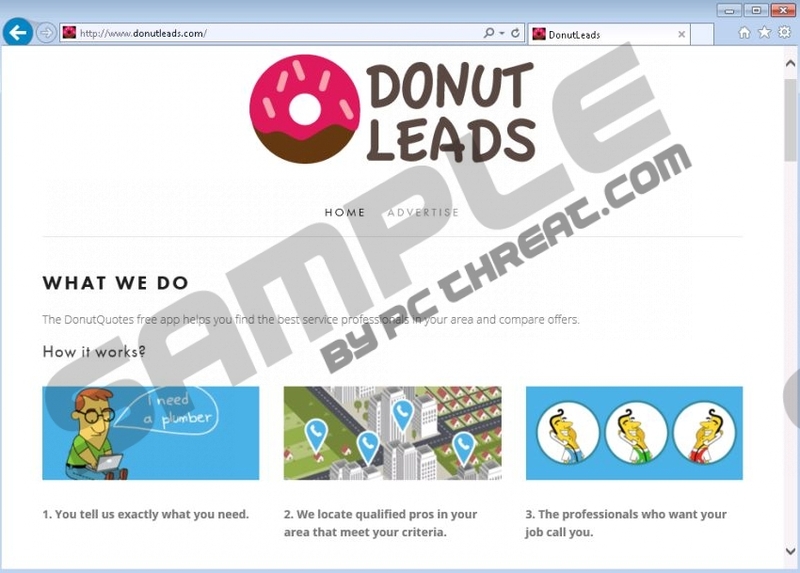 The website says that DonutLeads is a free application that “helps you find the best service professionals in your area and computer offers.” It definitely comes across as a useful application that can provide you with a unique service. 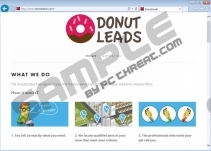 However, DonutLeads is a free application, and it means that is supports third-party advertising. As long as you have this application on your PC, you will be a subject to constant pop-up ads that will appear on your browser whenever you access affiliated websites. What is more, users seldom download DonutLeads willingly. The official website says that this application can also be downloaded with some third-party programs. According to our research, it happens when you download and install freeware apps from third-party websites. Adware and freeware often travel in bundles, so whenever you download a program from a third-party file sharing websites, please do consider the possibility that it may be bundled with DonutLeads installer as well. If you fail to read the installation wizard, whether you like it or not, DonutLeads will get installed on the PC. Technically, there is nothing too dangerous about this application, but it does display commercial advertisements, and they are not random. When DonutLeads is installed on your computer, it runs a service in the background called DonutLeadsService.exe. This service tracks your web browsing habits and later on processes this collected information to create a customized flow of commercial ads. The problem with DonutLeads and other similar applications is that they can be easily exploited by cybercriminals as long as they want to. Hence, if DonutLeads ads get embedded with corrupted content, you might be redirected to suspicious websites if you click any of the ads. These security concerns should be taken into account immediately, and you should uninstall DonutLeads without further ado. Also, if you think that there might be more unwanted applications on your computer, scan the system with SpyHunter free scanner. Do not hesitate to acquire a reliable antispyware application that would protect your PC from similar threats in the future. Drag mouse cursor to the bottom right of the screen. Select Uninstall a program and remove DonutLeads. Click Uninstall a program and remove DonutLeads. Select Add or remove programs and uninstall DonutLeads. Quick & tested solution for DonutLeads removal.